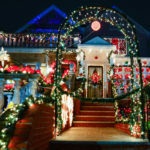 In the hustle and bustle of the holidays, what most of us crave more than presents is the gift of time in which to appreciate the joy of the season. 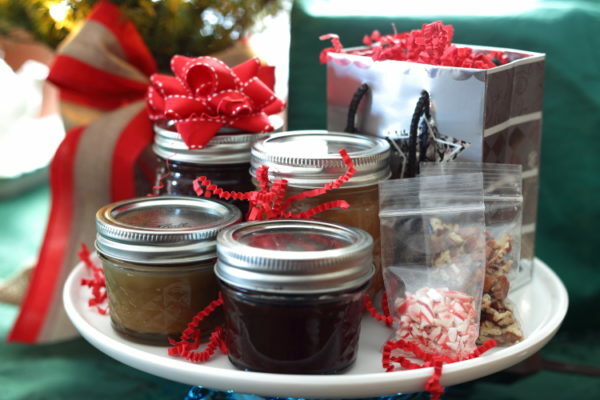 If you’re tired of schlepping through shopping malls and wandering through websites to find just the right things to buy, consider making some simple gifts from the kitchen for the loved ones on your list. 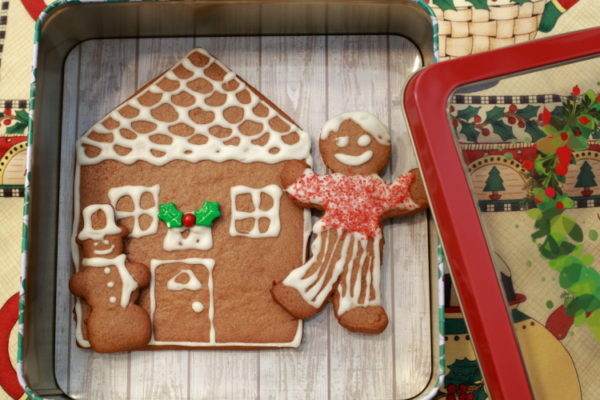 Not only will your gifts be more meaningful, since the lucky recipients will know that you gave of your time and talents to craft something special, but making gifts with your kids gives you a cherished memory of time spent together in the kitchen. These 10 great gift suggestions range from a simple stirring together of ingredients to more advanced candy-making. Let these crafty sessions double as work on math skills for little ones as they measure and add, or consider it a practical application of food chemistry for older students who can try the more advanced candy-making. 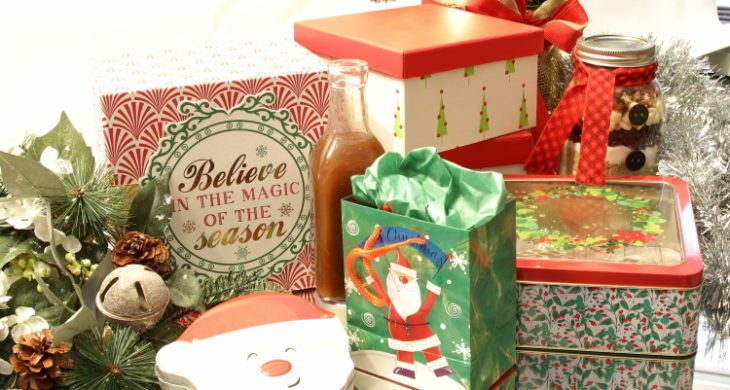 Then, let everyone get a little artistic, honing their design skills as you package up these tasty, homemade presents. Nothing says warm and cozy like a cup of hot cocoa! With this simple recipe, you can make your own mix, ready in mere moments. This version handily beats out the store-bought kind for real chocolaty flavor. Just chop 1 1/2 cups of chocolate chips in a food processor until finely ground. Combine the chocolate with 1 1/2 cups cocoa powder, 2 cups powdered sugar, 3 cups nonfat dry milk, and a pinch of salt. 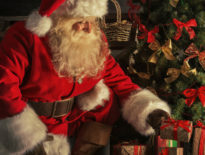 Package the powdered mix in a jar or tin, along with a card instructing the recipient to use about 1/3 cup dry mix per 1 cup of hot water or milk. 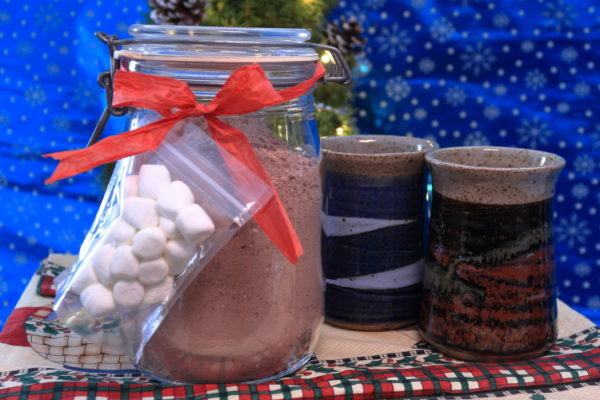 To round out the gift, add in a new mug and some festive accompaniments such as marshmallows or peppermint sticks. 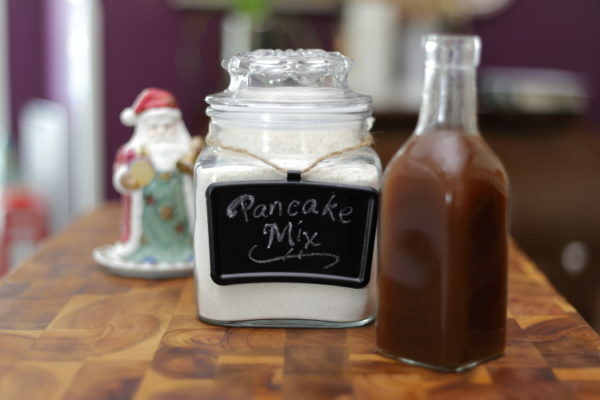 Make morning easier for someone special on your list with this great-tasting and good-for-you pancake mix. So simple—a mixture of 5 cups whole wheat flour, 3 cups all-purpose flour, 1/2 cup sugar, 2 1/2 tablespoons baking powder, 4 teaspoons baking soda, and 4 teaspoons salt—builds the foundation for a tasty hot breakfast. Include a recipe card so they know how to whip up a batch using 1 cup milk or buttermilk, 1 large egg, and 2 tablespoons melted butter or oil for each cup of mix. As an added bonus, include a jar of homemade apple cider syrup. Just combine 1/2 cup brown sugar with a tablespoon of cornstarch and a teaspoon of cinnamon in a small saucepan. Add in 1 cup apple cider and bring to a simmer, whisking occasionally. Pour into a bottle and allow to cool before sealing. 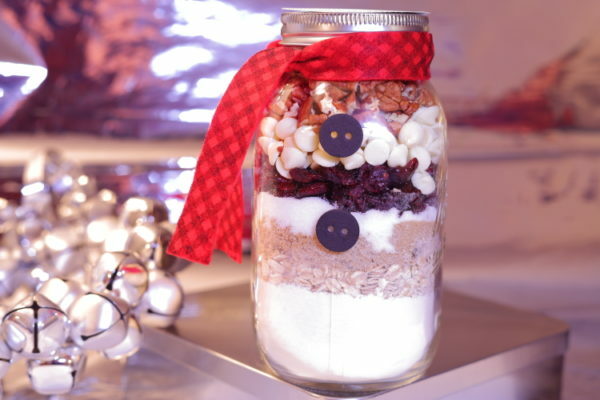 In the jar: 1 cup plus 2 tablespoons flour mixed with 1/2 teaspoon baking soda and 1/2 teaspoon salt; 1/2 cup rolled oats; 1/3 cup packed brown sugar; 1/3 cup white sugar; 1/2 cup dried cranberries; 1/2 cup white chocolate chips; 1/2 cup chopped pecans. To bake cookies: Preheat oven to 350 degrees. Beat together 1/2 cup softened butter, 1 large egg, and 1 teaspoon vanilla until fluffy. Add all the ingredients from the jar and mix until blended. Drop by spoonfuls onto a parchment-lined baking sheet, and bake for 8 to 10 minutes. For any ice cream aficionados on your list, use this gift season to set them up for a month of delicious sundaes! Create a classic hot fudge sauce and include some crushed peppermints as a topper. Or toast some chopped pecans to accompany a simple and luscious toffee sauce, made by bringing 1/2 cup butter, 1/2 cup muscovado (raw) sugar, and 1/4 cup honey to a boil. Stir in 1/4 cup heavy cream until smooth and allow to cool. 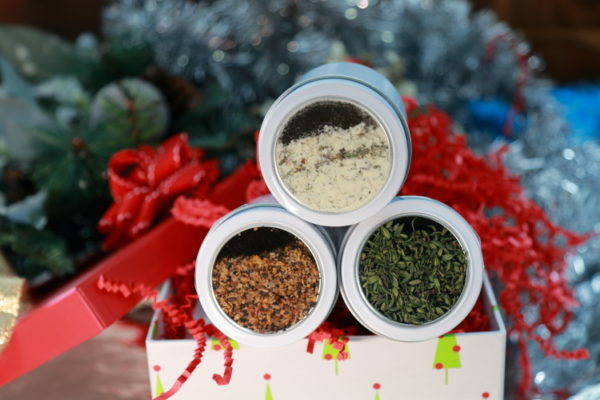 Spice up the holidays for the cooks on your list with some homemade seasoning mixes and dry rubs. Try mixing up your own combinations, or assemble some favorites like these, including ranch seasoning, Montreal steak spice, and herbs de Provence. Here are some basic blends to get you started, but feel free to do some real globetrotting with different flavors. Try garam masala, dukkah, and five-spice powder. 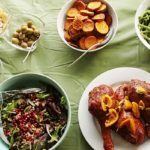 Even better, learn some culinary or celebratory traditions of different cultures with your kids while you research spice blends. After all, haven’t we all heard that variety is the spice of life? Here’s an irresistible sweet-and-salty snack that never fails to delight—especially if, just like Cracker Jacks, it has a prize inside! For this old-fashioned favorite, mix 10 cups popped corn with 1 cup peanuts in a large bowl. In a small saucepan, bring 1/2 cup butter, 1 cup packed brown sugar, 1/4 cup sorghum or molasses, and 1/2 teaspoon salt to a boil. Off the heat, mix in 1/4 teaspoon baking soda, 1/2 teaspoon vanilla and a pinch of cream of tartar (the mix will foam). 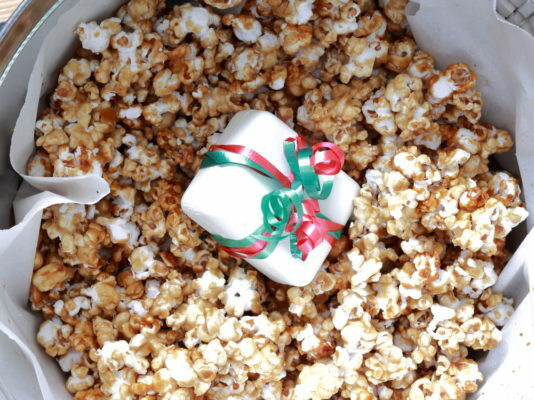 Pour the caramel over the popcorn, stir to evenly coat, then spread out on two large parchment-lined baking trays. Toast the caramel corn in the oven at 250 degrees for 30 minutes, stirring occasionally. 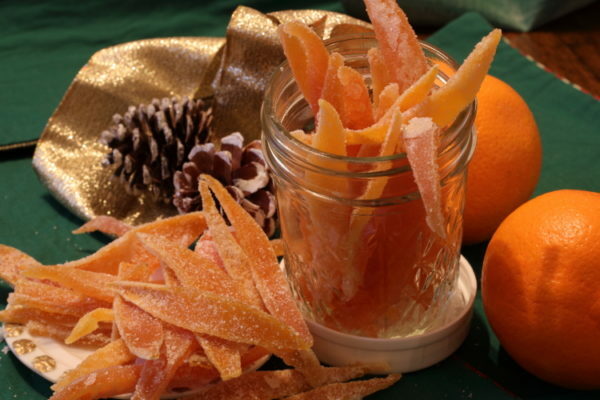 Several years ago, my fondness for old-fashioned candies and for kitchen frugality led me to try my hand at candied orange peels. 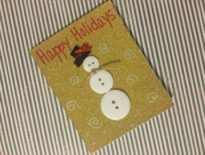 It’s still one of the most-requested items when I send Christmas care packages to friends and family. Over the years, I’ve expanded to include other types of citrus peel, and I sometimes toss them in sugar mixed with a tiny bit of vitamin C crystals for a sweet-tart taste. 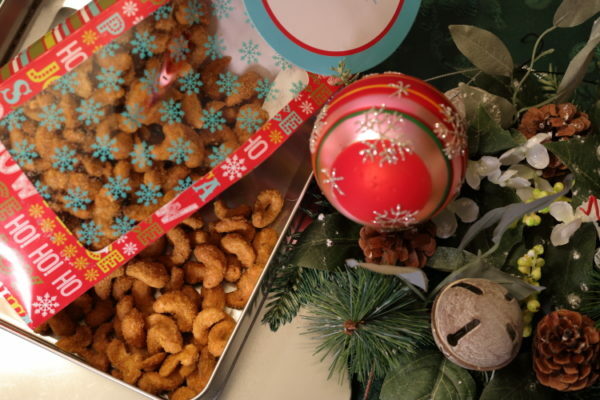 Got someone a little nutty on your list? Make a batch of spice-roasted nuts, like these curried cashews. They’re sweet and spicy and downright delicious. Everyone’s sure to go nuts for them! Just combine an egg white with a tablespoon of water and 1/2 teaspoon salt. Add a pound of raw cashews, toss to thoroughly coat, then drain in a colander. Meanwhile, mix 4 teaspoons curry powder (or other spices) into 2/3 cup superfine sugar. Stir together the sugar and nut mixtures, then turn out onto two parchment-lined baking sheets. Toast at 325 degrees for 45 minutes, stirring every 15 minutes. It’s just not Christmas without a little fudge. I like to use high-quality bittersweet chocolate and toasty walnuts in a classic cooked candy version. 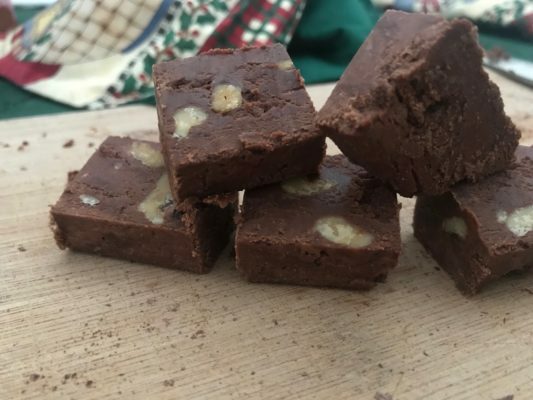 Although it’s a little trickier than the easy chocolate fudge recipes, it doesn’t need refrigeration and can be kept for up to a month. This makes a batch large enough to share with several chocolate lovers. 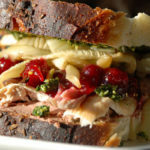 I hope you’ll sample some of these, or find your own kitchen creations to make with your family. Share your proudly homemade creations in our comments section!